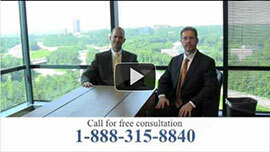 Thank you for your interest in our Orlando, FL law firm. Orlando, Florida is home to more than just theme parks. Orlando, FL residents and tourists alike realize that Orlando is one of the most fun and exciting cities in the Southeast. Orlando is a destination for people all over the world to come and experience it’s many amazing theme parks. Orlando is sunny, thriving, and accommodating. However, every city has it’s fair share of problems. Although Orlando is a wonderful place to live and to visit, the traffic problems lead to hundreds of accidents every year. Therefore, at Link & Smith P.C., our personal injury attorneys believe that residents of a sunny city should never be left out in the cold when it comes to legal representation. This is why our personal injury attorneys give this city’s residents top-notch personal injury legal representation in Orlando. Our attorneys are capable of helping our clients achieve superior case results. In fact, clients who have been represented by Mark Link and Houston Smith have achieved case results worth upwards of $40 million! …and a plethora of others. Additionally, our personal injury lawyers are regarded as the accessible lawyers. This means that, despite the fact that our attorneys represent clients from all over the Southeast, they are able to give each and every one of their clients the individual attention they deserve. In addition, our attorneys offer our clients all of the legal benefits including: investigating our clients’ cases, giving our clients legal advice, drafting legal documents for our clients, and representing our clients’ cases in court. Our Orlando, FL personal injury attorneys also work exclusively on a contingency basis, meaning that you will never pay any up-front fees. Our attorneys have over 40 years of combined experience in personal injury law, and they are veteran trial lawyers. With all of these credentials, it is clear that our attorneys at Link & Smith P.C. are more than qualified to give Orlando residents the legal representation they deserve. If you live in one of the most vibrant cities in Florida, you need the Orlando injury lawyers who will give you the individual attention you deserve. While other lawyers charge prospective clients for just a few minutes of their time, our injury attorneys always offer complimentary consultations. This means that you can get to know our lawyers, and find out about the specifics of your case, including prospective compensation and the benefits of hiring a personal injury attorney. For all of your personal injury needs in Orlando, choose Link & Smith P.C. For a complimentary consultation about any type of personal injury, call our Orlando personal injury lawyers today at 888-315-8840.